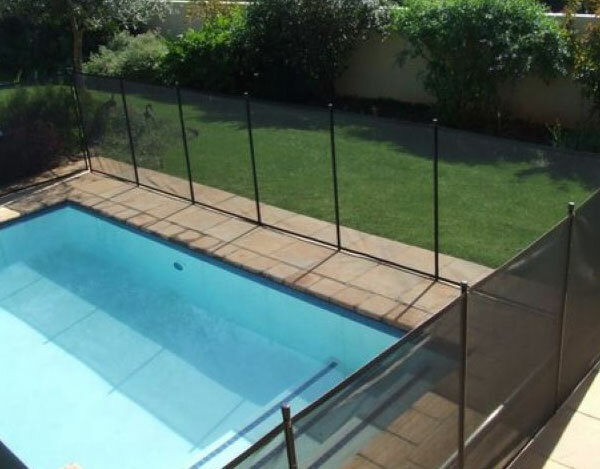 Swimming pool fencing is still considered to be one of the simplest ways to secure a pool. 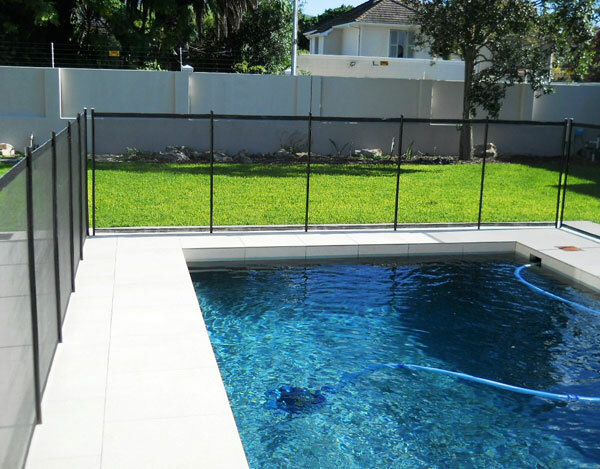 The Aqua-Fence is an attractive solution and can be removed or replaced when required. 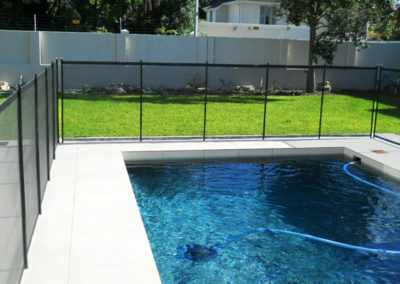 Based on similar systems found in Australia and America, the Aqua-Fence is a trail blazer in the pool fencing market. 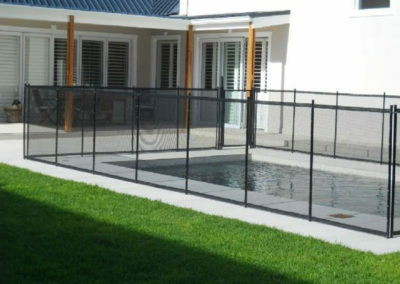 The Aqua Fence is easily fitted, removed and stored away by an adult. 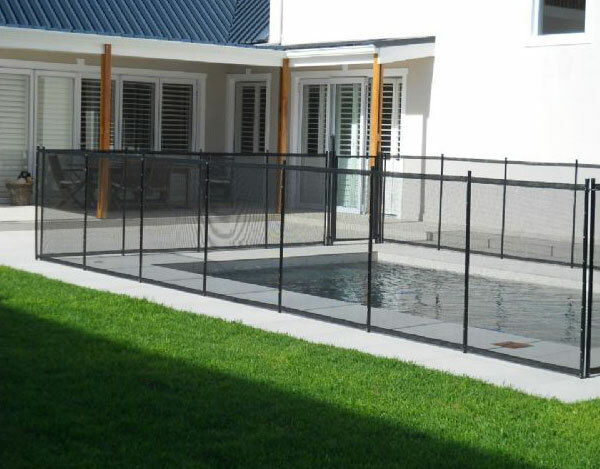 The Aqua-Fence is fitted in panels/sections to make removal, storage and refitting easy. 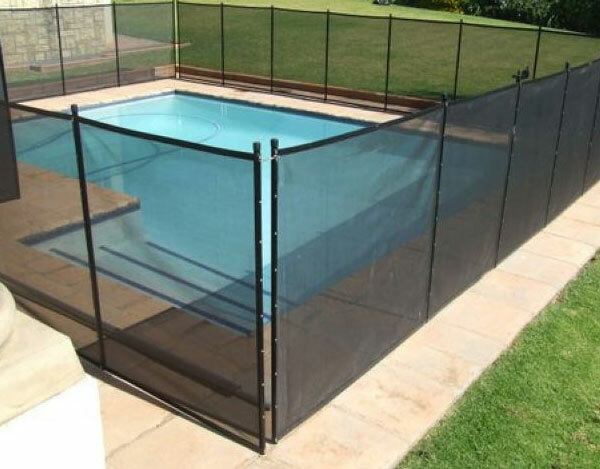 It is possible to only remove certain panels/sections on their own if necessary, while the remainder of the fence is left in place. reinforced aluminum poles powder coated in black. a woven Textalene mesh made from fiberglass coated in PVC. 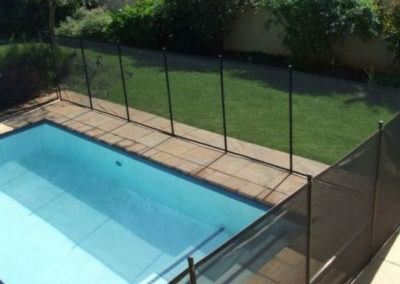 The Aqua-Fence blends beautifully with any garden or swimming pool environment. 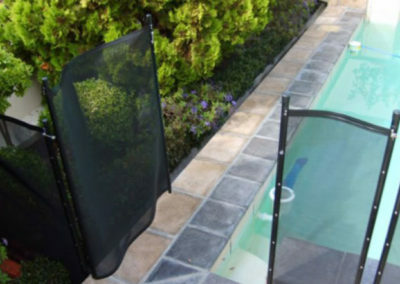 It does not interfere with regular swimmers allowing easy access to the swimming pool area, without the need to fit or remove a net or cover. The fence requires little maintenance. It is lightweight and fully removable. 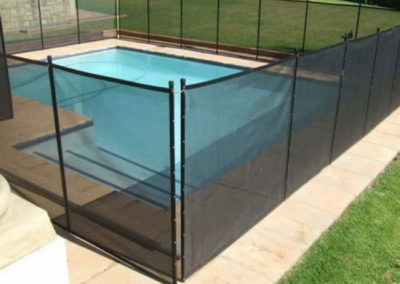 It is not recommended to prevent dogs /animals from accessing the pool area. 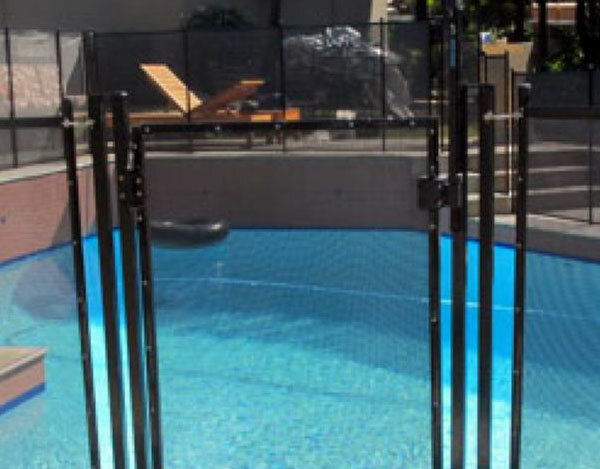 The Aqua-Fence should not be used where dogs may jump up against the fence as this may cause severe damage as a result of clawing. 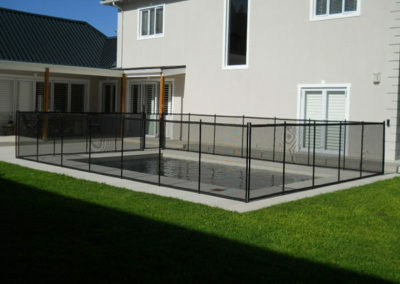 The Aqua-Fence is not recommended in areas that are prone to high winds. 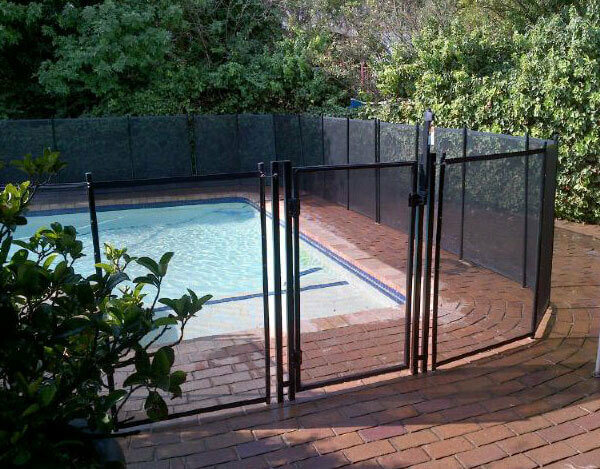 The Aqua-Fence is only safe if it is correctly fitted in place and the gate is locked. 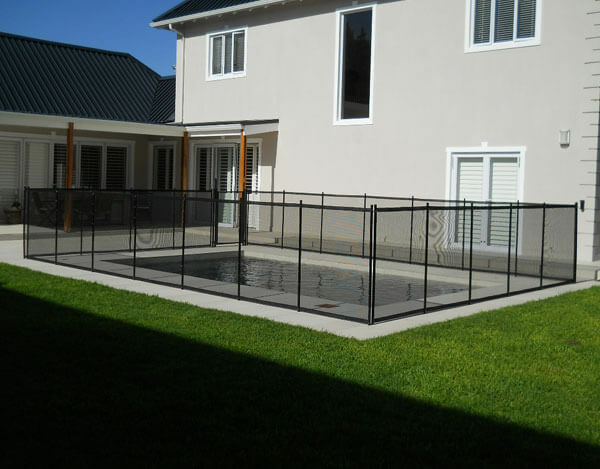 Ensure that no objects are close at hand that may allow a child to climb over or under the fence, cut the material or open the gate. Textalene is a PVC coated UV resistant fibreglass material that has great strength. 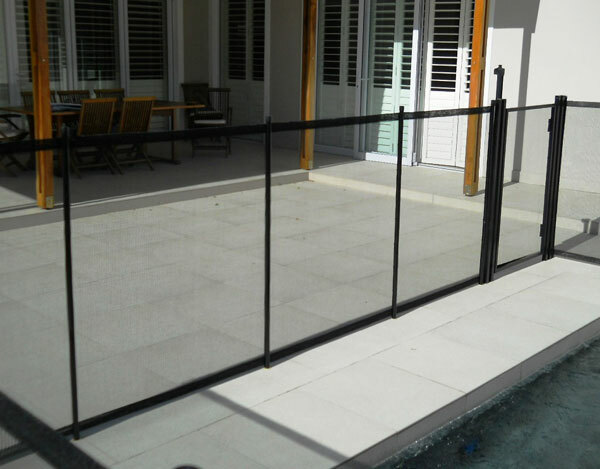 Aluminium powder coated cover strips are secured to the fence poles using stainless steel screws, holding the material in place. 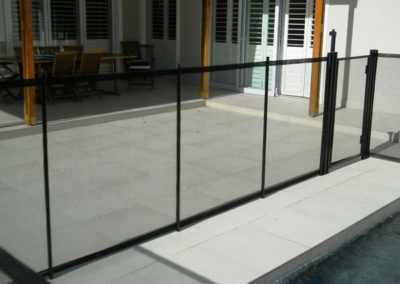 Does not detract from the aesthetic of the paving around the pool. 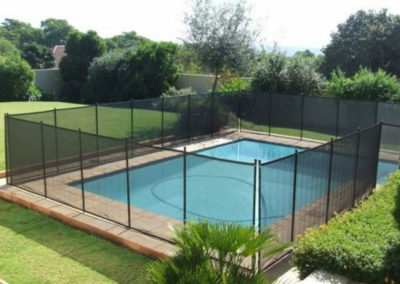 Before removing the Aqua-fence, ensure you know which panels go where, for reinstallation purposes. Pack away the panels in the order required for reinstallation. It is helpful to mark each section with chalk or tape to allow for simply refitting. Start by removing the latches between the panels/sections. Once all latches have been released, twist and pull the first pole up and remove the pole from the sleeve. Roll the material up until you come to the next pole. Twist and pull and continue with this process until the entire fence has been removed. 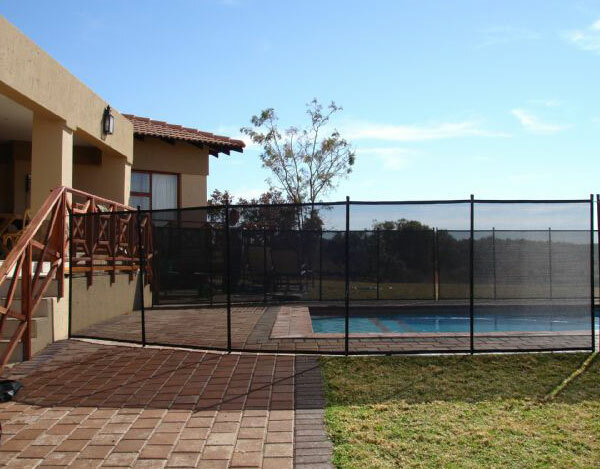 Ensure when rolling up the fence that the material does not crease or fold. 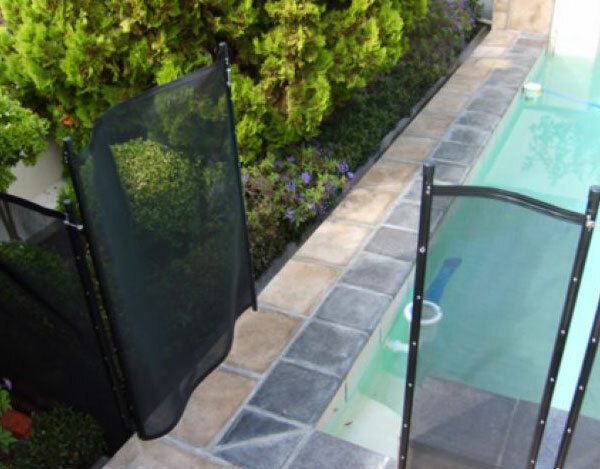 Pack individual panel sections away out of the sun in a cool place free from rodents. Lastly remove the gate. A hammer may be required to assist in removing the gate posts. Cover the sleeves/holes with the white cover caps supplied. Remove the white cover caps opening the sleeves/holes. Clean the sleeves out if necessary. A hosepipe and water can be used to spray out any dust or sand. It is useful to apply grease or a lubricating spray to make future pole insertion and removal easier. Start with the gate and place it into position. Make sure it is completely inserted into the sleeves and is level. Bearing in mind the order in which the panels were removed and stored, begin by placing one of the end poles into its correct sleeve and make sure it goes into the hole all the way. Carry on doing this – pole by pole, panel by panel. 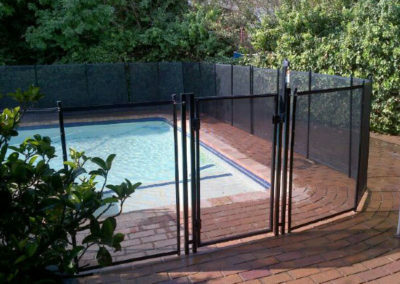 Once all the panels are in place, tension the fence by hooking all the latches into place. Test the gate by opening and closing it a couple of times. 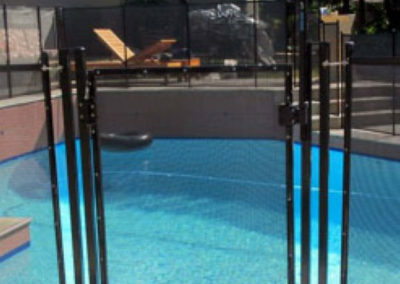 If for any reason the gate does not click closed it may not be level and should be adjusted. 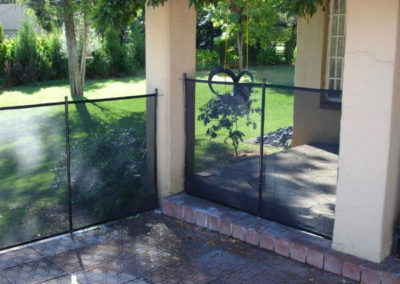 The locking mechanism can also be adjusted to allow for movement of the gate. 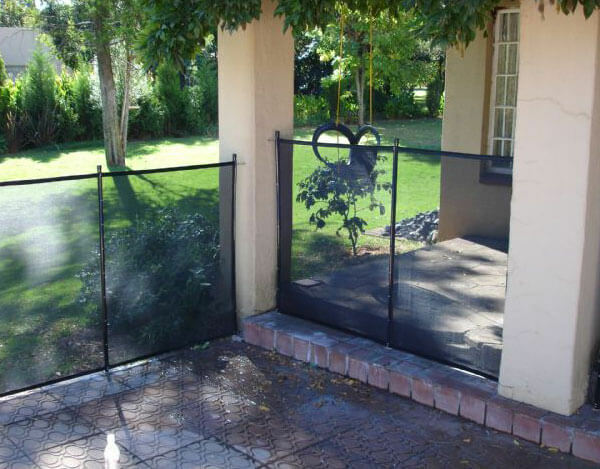 Lock the gate with the key provided and remove the key and store in a safe place. 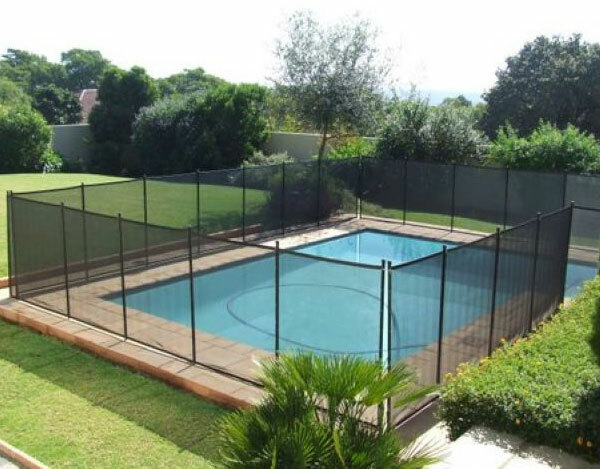 Ensure that there are no objects that could allow a small child to climb over the fence. 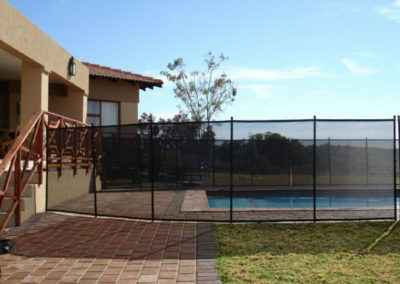 Dogs may chew the fence to get to the pool area. Should this happen it is possible to repair the fence depending on the extent of the damage. Dogs should be discouraged from jumping up against the fence. A dog repellent spray is also available to assist in discouraging dogs from chewing the fence. Clean out the sleeves if dirt/dust or sand is present. Use a garden hose to spray water into the sleeve blowing out any dirt present. Ensure that all latches are functioning correctly and are fastened. The gate closing action can be adjusted from slow to fast. Remove the cover cap on the hinge. Using a flat screwdriver, push down and twist to the left or right dependant on the desired setting. Please note that a gate set to close too fast, can cause injury should a person or child be in the way of the closing action of the gate.